Wexford Wildfowl Reserve is located on flat farmland on the North Slob which was walled off from Wexford Harbour and reclaimed from the sea in the 1840s partly as a famine relief project. The main habitat types are farmland and a brackish channel. Much of the area lies two metres below sea level and rainwater is pumped out using a water pump located in an old pump house near the Nature Reserve Visitor Centre. Wexford Wildfowl Reserve is jointly owned and managed by the National Parks and Wildlife Service and BirdWatch Ireland. First established in 1969 the reserve covers about 200 hectares, a quarter of the North Slob. Today the Reserve is part of the larger Wexford Slobs and Harbour Special Protected Area (SPA), a designated Ramsar Site, part of a Special Protection Area (SPA), a proposed National Heritage Area (pNHA), and a National Nature Reserve. It is in the European network of nature protected areas called Natura 2000, the aim of which is to secure the long-term survival of Europe’s most threatened and vulnerable species and habitats. Over 250 bird species have been recorded on the Reserve, many of them Winter migrants from Greenland and Arctic Canada or from Scandinavia and Arctic Russia. Greenland White-fronted Geese are the most numerous and important goose species on the reserve and it is for them that it was established. They breed on the western lowlands of Greenland during the summer and winter in Ireland and Scotland from October to March. The North Slob holds about 8,500 or 45% of the current world population of Greenland White-fronted Goose during these months. The birds and other wildlife on the Reserve can be watched from the 8 metre-tall observation tower and three other hides. The Pat Walsh Hide on the sea wall about 1 kilometre before the Centre itself overlooks the main channel. The Pump House Hides next to the car park overlook the main channel and the sea and the Robert Jobson Hide overlooks a reed-lined pond. The Reserve is owned in partnership with BirdWatch Ireland, a national voluntary organisation. BirdWatch Ireland is Ireland’s largest conservation charity and is dedicated to the protection of Ireland’s wild birds and their habitats. For more information about the Reserve,contact the warden, Dominic Berridge. For more information about educational services, contact the education officer at wwreducation@ahg.gov.ie. You can also download our Wexford Wildfowl Reserve brochure by clicking here. If you have concerns about Avian Influenza please phone the Department of Agriculture, Food and the Marine Avian Influenza Helpline at (076)1064403 or after hours (1850)200456. Do not handle a suspected infected bird. 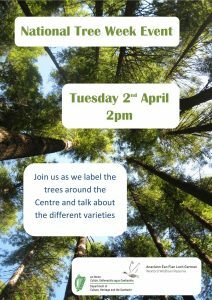 Join us for a tree week event on Tuesday 2nd April at 2pm as we label the trees around the Wexford Wildfowl Reserve and talk about the different varieties that grow around the Centre.